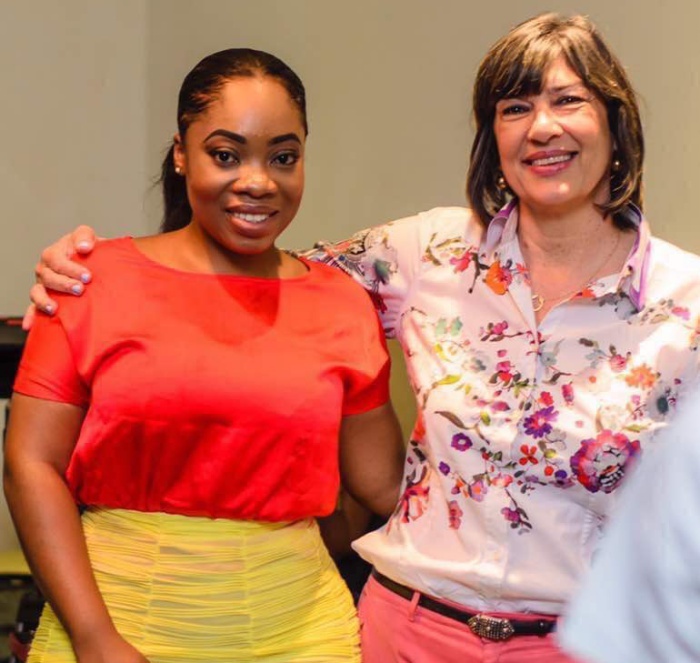 Award-winning International Journalist, Christiane Amanpour, has commended Ghanaian actress, Moesha Budonita Boduong for her frankness, adding that she would be a great mother in the future. In a video that was supposedly taken behind the scenes after her controvercial interview with the CNN anchor, she was seen admonishing the actress to be strong and wished her luck in life. Christiane Amanpour was heard telling the actress to allow her own daughter to be free and independent. The international journalist added that Moesha’s daughter would be happy to have her as a mother judging by how she (Moesha) had to work hard to make a living for herself. “When you have your own daughter, good luck. She should be free and independent. She will be lucky to have you as her mum”,Christiane Amanpour told Moesha. Moesha shocked many Ghanaians and her interviewer when she admitted that she slept with married men for money. The Ghanaian actress who doubles as a model revealed that it was almost impossible as a woman to make enough money. She said to be a successful woman, one needed a man to take care of her – to provide the financial needs of the woman. However, the actress has received widespread backlash from some Ghanaians on social media and have called her out for degrading very hardworking Ghanaian women. This fact notwithstanding, some internet users have jumped to the defense of the actress and have called Ghanaians bashing Moesha as ‘hypocrites’. Moesha is noted as saying, “Ghana, our economy is such that you just need someone to take care of you because you can’t make enough money as a woman here. When you want to get an apartment, in Ghana you pay two years in advance and I just started working, where will I get the money,”. Her comments have generated a lot of debate on social media in Ghana with many people disagreeing with her assertion.